ProsLarge Capacity, Waterproof, Well constructed. 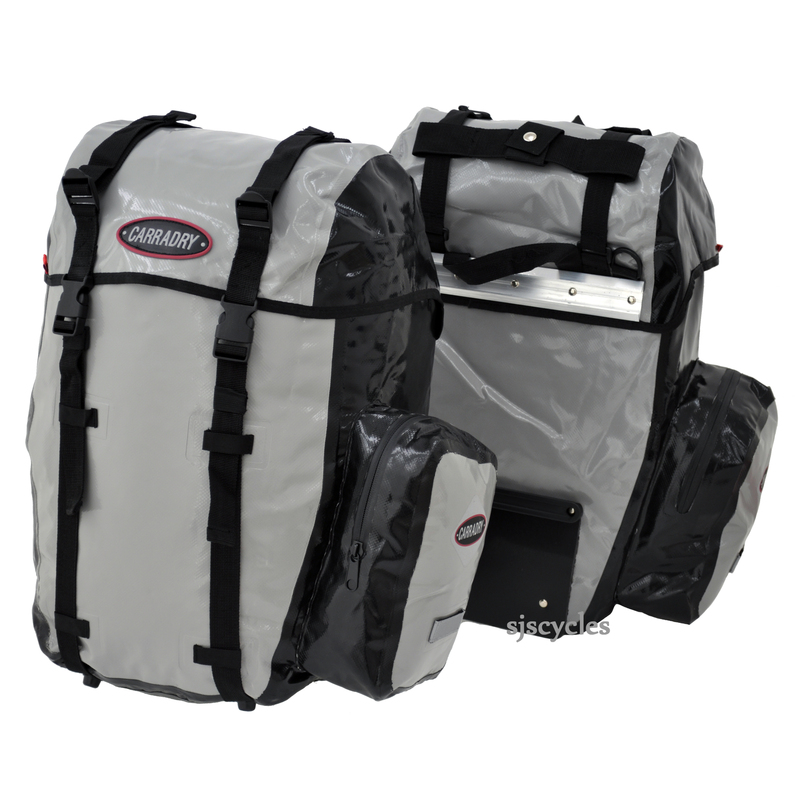 I've had lots of panniers over the years and these are without doubt the best value and most waterproof I've used. Very difficult to find this amount of litres storage for such a reasonable price. Well constructed, good rack securing system a must for any touring cyclist. Proswaterproof, plenty of capacity, pockets. These seem to be of a thick polythene construction and I've only had then a short time so I can't say anything about durability, but they should cope with any amount of rain. Be aware that there is 385mm from the top of the rail the panniers hang from to the bottom of the pannier, so this may interfere with the rear changer etc. (for me I think this would limit using the right pannier to one of my two bikes, fortunately the one I use most!). Personally I'd probably not get it again for that reason. Like my previous Carradice panniers it has an outside pocket convenient to keep lights etc. in. The attachment mechanism works well. They're big, waterproof and (I think) they look great when fully loaded. The external extra pocket has proven to be very handy. They fit onto my Tubus racks rattle free and although the clips feel fiddly to start with, a few uses will ensure you get the hang of them. I bought mine specifically for a tour, but since then I've surprised myself by how much I use them day to day. Bought to replace/supplement some very large roll-top panniers. Initially appeared smaller than I thought, but it takes a couple of days use for them to fully expand from their packed size. We find this size and material the ideal shopping and holiday type - very easy to keep the insides clean. Only the carrier clips are fiddly - the positioning of the straps and internal reinforcement makes them more awkward than usual to use.